A sick Ranganatham (Nagaiah), who goes to the city for medical treatment, leaves his only son Krishna (NTR) in the custody of Panakalu (SV Ranga Rao). Nagaiah gives money for NTR's education, but SV Ranga Rao uses it to buy land in the city. Over the years, SV Ranga Rao educates his son Mohan (Jaggaiah) and makes Krishna an illiterate. SVR promises his brother-in-law to get Jaggaiah and Lakshmi (Devika) married. However, Devika and NTR love each other unaware of this fact, and eventually due to disputes NTR leaves the house. On the other hand, Jaggaiah marries a rich Zamindar's (Rajanala) daughter Nirmala (Jayanthi). 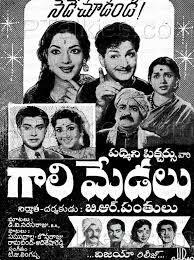 Gaali Medalu (1962) A sick Ranganatham (Nagaiah), who goes to the city for medical treatment, leaves his only son Krishna (NTR) in the custody of Panakalu (SV Ranga Rao). Nagaiah gives money for NTR's education, but SV Ranga Rao uses it to buy land in the city. Over the years, SV Ranga Rao educates his son Mohan (Jaggaiah) and makes Krishna an illiterate. SVR promises his brother-in-law to get Jaggaiah and Lakshmi (Devika) married. However, Devika and NTR love each other unaware of this fact, and eventually due to disputes NTR leaves the house. On the other hand, Jaggaiah marries a rich Zamindar's (Rajanala) daughter Nirmala (Jayanthi)..